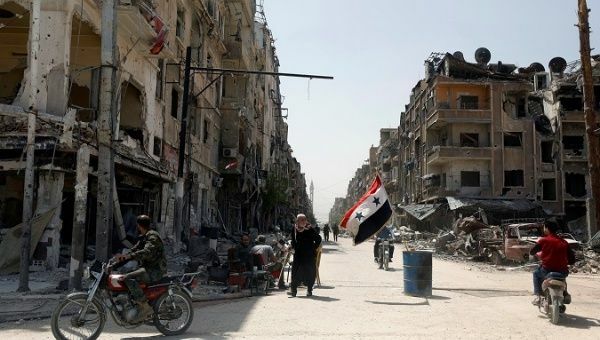 April 21 (teleSUR) Syria‘s Assistant Foreign Minister Ayman Sussan says the Organization for the Prohibition of Chemical Weapons (OPCW) investigation into alleged chemical weapons use will “expose the lies” of Western nations. “If they are saying that chemical (weapons) were used in Ghouta, and if (U.S. President Donald) Trump or France and Britain really wanted to know the truth, they should have provided appropriate conditions for the OPCW to carry out its mission as it’s the organization involved in this matter, and not to encroach upon the work of the international institutions and launch accusations and verdicts and then implement punishments,” Sussan told Xinhua on Saturday. The OPCW team arrived in Damascus on April 14, only hours after the United States, United Kingdom and France launched missile strikes against the Syrian capital in ‘retaliation’ for the alleged attacks. The team faced difficulties entering Douma, however, coming ‘under small arms fire’ that forced them to return to Damascus. Reports emerged that the team had entered Douma again on Friday, although no further details have emerged. “The Western powers thought that the strike on Syria would push the Syrian government to react by preventing the mission from entering Douma and that this would indicate that the Syrian government won’t cooperate. The official said that, “unlike the Western stance,” Syria still “respects the international legitimacy and the work of international organizations.” When Syria joined the Chemical Weapons Convention in 2013, it had given up all of its chemical stockpiles, he said.